The need for safe play areas around the world is overwhelming. Often the hardest part of what we do is selecting which projects to support. At any given time we have numerous proposals for play areas in need of funding. Unfortunately, without the necessary resources, we can’t address them all. How do we select a playground site? At this time, we our focusing our efforts on the war-torn areas of the Middle East, including Afghanistan, Palestine and Iraq. The need in these areas is great. 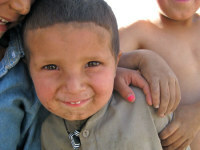 For example, in the province of Herat, Afghanistan there are at least 780 schools in need of playgrounds. To date, we have completed just seven in this area, and there are lots more on the waiting list. The following criteria help guide our decision to move forward with a proposal. The area proposed for a play space should be contained and easy to supervise. We look for existing walls, proximity to the accepted authorities and a committment from the implementers to monitor the playground and quickly carry out any required repairs. We only build in areas where we have been invited to build. We ask those involved to contribute their own resources; land, time, materials, equipment and oversight so that they have an inherent sense of ownership over the finished play area. We consider whether the site proposed for a play space is within an area where our current partners can oversee the project or if we will be required us to seek a new local relationship to complete the project. If not, we may need to consider such a project at a later date. We look at the relative need of the community surrounding the proposed play area and ask the following questions. Do these children already have easy access to other safe play areas? Are there other implementing agencies operating in this area that could contribute? How many children will be using the play area?